Please refer to our stock # 2003 when inquiring. 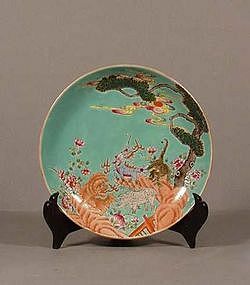 This late 18th century or early 19th century Chinese porcelain plate is 6 3/4 inches in diameter. It has turquoise background with legendary animals in garden design. There is Jia Qing (1796-1820) mark on the back. It is in great condition.